Last winter, like many other bloggers who dabble in artsy+crafty things, I was quite inspired by Jane's and Alicia's ripple blankets. Those two seemed to have inspired a movement over at "the no-end-in-sight ripple along." After reading about everyone joining in on the fun, I wanted to crochet. Like. right. now. So, when my mom and I met for a few days in Arizona, I brought along my crochet hook so she could teach/remind me how to crochet. I learned about 20 years ago from Nanny…not my grandmother but the mother of my second cousin's wife who was a bit like a grandmother to me at times…and I crocheted a few potholders that year. I loved it, but I didn't pick it up again until February of last year. 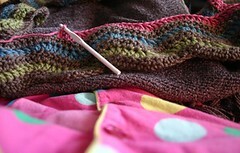 As my mom and I worked on a couple of scarves, I settled into the rhythm that is knitting and crocheting. Several scarves later, the rhythm of crochet resonates deeply in me. And, I felt ready to make an afghan. And, of course, not just any afghan…THE afghan. So I tried one pattern and crocheted my heart out throughout the second half of the Super Bowl. By the end of a very long row three, it was apparent that I did not understand the pattern even though I kept trying. I tried another pattern I found online…but just couldn't get into the rhythm at all. It involved a chain stitch after a few stitches several times and I kept forgetting it and wouldn't realize it until the middle of the next long row. Then the book Vintage Crochet arrived in all its gorgeousness. To begin the chevron pattern, I needed to chain 216 +3. I, of course, chained 219 +3 because I kept repeating 219, 219 in my head while counting. I didn't realize the problem until things got wonky in row three.